To begin, let’s do a short recap of part one. In part one I broke down HTML along with giving a brief description of each version of HTML. You can read the whole part one of getting started with html here: HTML Tutorial Part 1. Now to get started, let’s open your text editor. You can use whatever you would like to use whether it be notepad or MS word, either will work. The first thing you want to do is enter the <!DOCTYPE>. The <!DOCTYPE> indicates the type of document you are producing. The reason you have to enter this first is because this is the set of instructions that your browser will see to determine what version of HTML the page is written in. Here is an example of what the <!DOCTYPE> looks like when entered. The next step is to insert the opening <html> tag. All tags must have an opening tag and a closing tag. 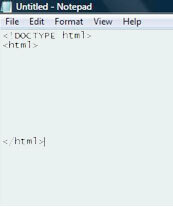 The </html> closing tag will come at the end of the document. Because it is easy to forget to place closing tags, it is best to place them at the same time you place the opening tag. Just leave some space in between each to add more content. This is what your page should look like now. Next comes the head section which will contain the information about your website. Inside the head section you can put the title of your website. Now, don’t forget the head tags and the title tags both need opening and closing tags. Also, make sure you give your new website a title so that when you open it in your browser it doesn’t say untitled document. Your page should now look like this. Following this you should enter the body tags. 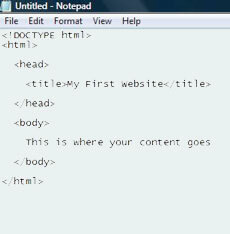 Inside the body tags is where the main content of your website will be placed. After entering the body tags, your page should now look like this. Your final step is to now save the document. You can name the file whatever you want but make sure that you end it with .html. After you save your website go ahead and open it up. There you have it. 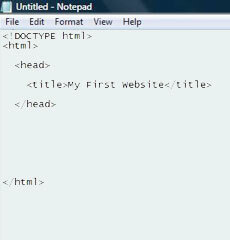 Your first HTML website.